Excellent advice. I've noted that the default in Studio 4.5 for maximum trace distance has been lowered to 150. Perhaps for this reason...but it also makes rendering a little faster. For people who aren't as wedded to 3D renders looking, well, real, there is the matter of the building walls and roof. You can set them to not cast shadows and that lets the light flow in unimpeded. Often model makers make walls and the roof 'removable' for camera angles. If you utilize that, it also causes the sunlight, from whatever source, to enter the space. just playing around with the materials for the Luxus plugin. There's hardly any grain there at all, how long did it take? Pretty decent for that amount of time. How does it compare to a Reality render left for that long? I just want to thank Bobvan for the tip about Callad of Reality. There are some nice goodies there. No problem I will no longer be offering advice and posting or dealing getting / Luxus. I think then Vendor needs to have thicker skin.. It's a long story & I don't want to get into it but will gladly offer Luxrender advice / tips. I dunno, I don't have the reality plugin, besides they both use the same renderer Lux..
as for using the 3delight, didn't try it, because there is alot more fiddling to try and get the same result. 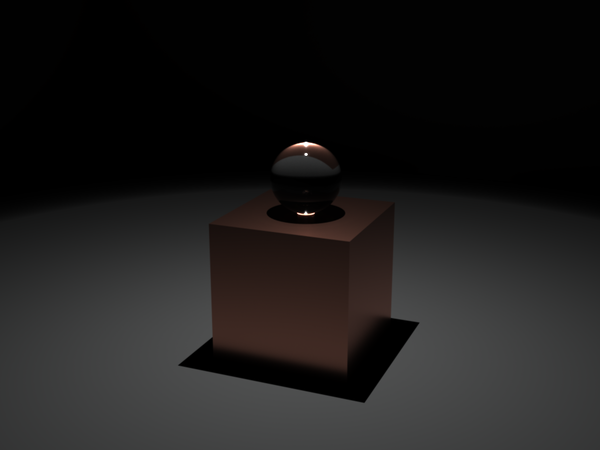 I haven't played with that yet, still reprograming brain back to photographic lighting mode for use with Luxrender. also playing with textures available to see how they affect the scene as a whole. the scene was also rendered inside a box but it was a 20m box so no light relfection off the sides that I could tell..
doing a new scene with a smaller box (room) and texture that should relfect more light into the scene from the lone spotlight. Thats one of the things I like about Lux is the lighting once you get used to it you will see how much better it works adjusting it as you render film response is another thing you want to get to know. well I know ISO, F-Stop, Shutter Speed etc.. been a photobug for decades now, only went DSLR in the past 5 years so that stuff is familiar to me..
Dont use Luxus so i would not know seems to be getting a good fan base. I am used to my work flow so I am staying with what works for me sides R3 will be here soon..
well do you tweak the gamma when using the Linear tone mapping? ok this is after 30 minutes. I paused it to export the image to a file, then resumed the render going to let it run for another hour or so while I go do some errands..
Auto Linear just has the film response + Gamma settings... Linear has the iso, shutter and f-stop AND a gamma setting along with the film response + gamma settings (two gamma settings.. although the film response does say gamma correction.. seems confusing)..
anyway.. with more settings tweaked. ah ok, makes a bit more sense now..
Kodak Gold 200 wow that brings back memories.. LOL. ok.. since this is an indoor scene.. I went back to my photog days..
30 minutes forget the s/p at that time frame..
eh, not sure what to tweak, the character shaders are the ones translated from Studio (Lana skin shader) with specular 2 turned off..
as for the hair.. I have the LAMH plugin, might try that with the hair .obj exported in studio, with a tweaked glossy lux material applied..
LOL it'l come. As I said we do what works for us glad to see you & Artini join us luxers! Roger one of these days? hmm well ok LAMH when sent to DAZ as an object file fails to parse to luxrender..
need to play with it more... later.. I think. I read on our forum at Rendo http://www.renderosity.com/mod/forumpro/showthread.php?thread_id=2849428&page=170#message_4004796 that these hair systems a bit tricky I still recommend the forum since alot of the tips do apply to Lux.